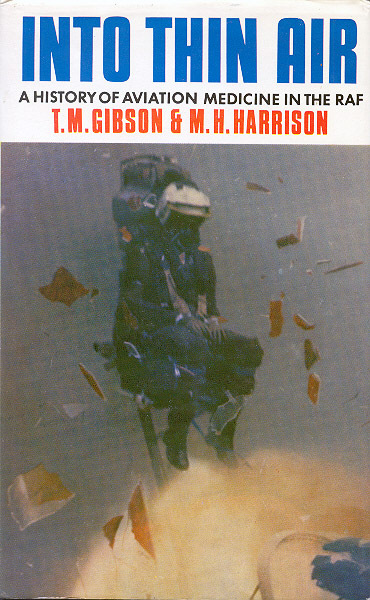 Book review "Into Thin Air"
Gibson, T.M. & Harrison, M.H. : Into Thin Air, A History of Aviation Medicine in the RAF. Robert Hale Ltd., London, UK, 1984. ISBN 0-7090-1290-X. 279 pages. I have just acquired a very interesting book, titled "INTO THIN AIR: A HISTORY OF FLIGHT MEDICINE IN THE RAF" (by Mike Gibson & Mike Harrison, both physicians in the RAF Medical Branch). Whilst ostensibly a history of aviation medicine in the RAF, this is also the story of RAF life support equipment. It has extensive historical background on the development of RAF oxygen breathing equipment (masks, etc. ), flight protective clothing, pressure suits, anti-G garments, personal flotation devices (PFDs), egress systems (E-seats), and far more. At 279 pages length & simply packed with valuable information and photographic images, this book is basic reference material for any serious student of aerospace life support technology. It is particularly useful in that it paints both a broad and precisely focused picture of the important early contributions made by UK researchers in the field of both aviation medicine and the life support sciences. Most regrettably, this book, which was originally published in 1984 (Robert Hale, London, ISBN 0-7090-1290-X), has since gone out of print and is available now only through specialised book stores and antique book stores in the UK. Rare copies of it will surface on eBay once in a great while, but it may be a bit hard to find now due to the publication of mountaineer Jon Krakauer's book on the disastrous Everest climb of 1996 (also titled 'INTO THIN AIR'), a few years ago. Trust me in that this book is well worth maintaining constant and unrelenting vigilance for; once you have a copy, you'll easily see why it is such an asset. The attached image shows the book's dust jacket (I was lucky enough to obtain a near mint copy through John Norman Bookseller in England (John Norman, Garden Flat, 14 Strafford Road, Twickenham TW1 3AE, England - normanbook@strafford99.freeserve.co.uk). Cost is modest and a small sum well invested for your reference shelf. One last thought: This book was the product of a series of RAF IAM (Institute of Aviation Medicine) historical essays on life support and aviation medical researches done by the RAF's Medical Branch from the 1930s through the early 80s (Drs. Gibson and Harrison were the authors of those papers). These IAM monographs are excellent in and of themselves and complement the book nicely, if you are fortunate enough to know someone who has copies.